These cupcakes are totally over-the-top! Inspired by the Snickers candy bar, they begin with the best-ever chocolate cupcake recipe (so easy to make! so moist! ), are topped with a luscious peanut butter buttercream frosting, a drizzle of salted caramel sauce, and a sprinkling of crunchy peanuts. Your friends will ask for these again and again! Place the egg whites and sugar in a large metal mixing bowl and whisk together. Set the bowl over a small pot of simmering water, and heat, whisking occasionally, until the mixture becomes translucent and no longer feels gritty when rubbed between the thumb and forefinger. Remove from heat and whip on high speed until the meringue becomes glossy and thick. Add the butter, a tablespoon at a time, while whipping on medium-high. When all the butter has been added, fold in the peanut butter, vanilla, and salt. Transfer the buttercream to a pastry bag fitted with a 4B tip. 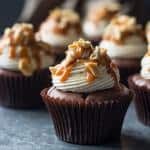 Pipe swirls of frosting onto the cupcakes, top with a drizzle of salted caramel sauce, and sprinkle with peanuts. For lots more info on the frosting, click here: Swiss Meringue Buttercream.